Banoffi Pie was created at The Hungry Monk Restaurant in East Sussex, England in the early 1970's. 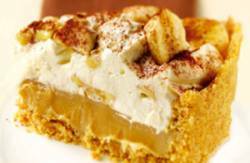 It is "oh so sweet" and made with a pastry or graham cracker crust (or a crushed digestive biscuit or gingernut crust) and filled with rich toffee and topped with whipped cream and sliced bananas, then the pie is dusted with cocoa or grated semi-sweet chocolate for decoration. Try this scrumptious pie for a birthday, a holiday dessert, or for any special occasion. WARNING! This pie in NOT for the calorie conscious or for those who are on a reduced sugar or reduced cholestrol diet. In a large saucepan, melt 4 oz. (1 stick) of the butter and stir in crushed graham crackers. Press into the bottom and sides of a 9-inch pie tin. Chill for 30 minutes. Place the remaining butter and the sugar in a nonstick saucepan over a low heat, stirring until the butter melts. Add the sweetened condensed milk and bring gently to the boil, stirring continuously. Boil steadily for exactly 5 minutes, stirring frequently, to make a light golden caramel. Pour over the biscuit base and chill for about 1 hour, until firm. To serve, slice the bananas and arrange most of them over the caramel. Spread with whipped cream. Decorate with the remaining banana and dust top with cocoa. i love it,i love it, i love it!!!!! i got to know it a few yrs ago, and i adore it since! last summer i went to India and i got a huge slice of banoffi pie in the middle of nowhere! i was overjoyed and was happy for the rest of the week!! I think if u bake your crust for few mins in a hot oven - it will give a very crunchy n toasted taste. This pie was a huge hit. It is very sweet and scrumptious!!! i love the taste. but the crust was not so good. it ruins when sliced. i tried to used more butter but it didn't help. any suggestions diana? DON'T Chill it in the refrigerator! (it ends up like a rock of caramel)! Very nice recipe, but for everyone who wants to make a good and healthy graham cracker crust you can make a whole pie crust and a topping only using like 2 or 3 tablespoons of butter. Just take about 12 graham crackers and blitz it in a food processor with about a tablespoon and a half of butter and press it into the pie dish. It holds well and is a lot less fattening. Tried making it 3 times....the milk mixture would not turn into a "caramel" color...stayed white. Maybe use brown sugar instead of granulated?